We had an early start to this hike and motivated by mosquitoes we reached the lookout in 45 minutes. We then quietly wandered over to the brass caps to take pictures. It was shortly thereafter that we met the lookout operator. 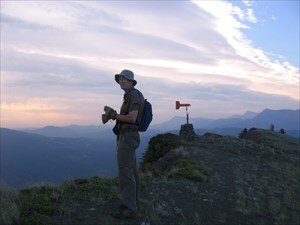 He informed us that he has never had hikers arrive at the lookout this early in the day. He invited us up to the lookout and after some idle chit-chat I said "I know you, you use to work at Mockingbird". We continued our conversation while Sleepy Hollow ran off to hide a cache nearby. Great location, thanks for the hunt. Sleepy Hollow at the Lookout.